Looking into the past, Mario has had his fair share of flight powerups. Super Mario Bros. 3 introduced the Racoon Suit and Tanooki Suit, which allowed Mario to soar into the air and float down easily. Super Mario World went a step further, allowing the player to not only soar up in the air, but stay in the air by nosediving and swooping back up into the sky. Both items allowed Mario to attack nearby enemies. In Super Mario World, the cape was practically Mario's version of the Screw Attack. The added mobility and offensive power made you feel unstoppable! In Super Mario 64, Mario gained the Wing Cap, which let him soar around levels in a whole new way. In Super Mario Galaxy, the Red Star allowed Mario to fly as well, even if its usage was very minimal. New Super Mario Bros. Wii introduced the Propeller Suit, which allowed Mario to gain some verticality, but not necessarily the freedom provided by other flight powerups. Super Mario 3D Land brought us the return of the Tanooki Suit, but its flight ability was nowhere to be seen. Mario could hover, yes, but couldn't take off like an airplane like in Super Mario Bros. 3. 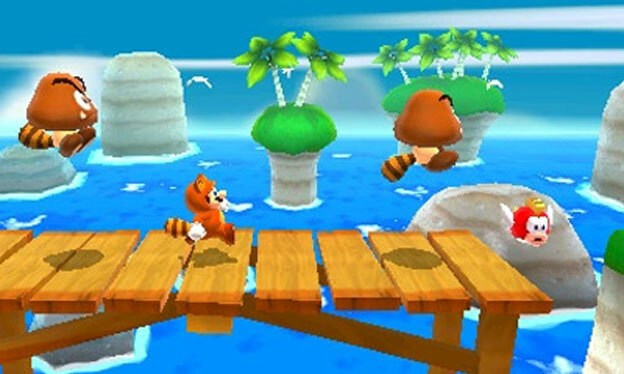 The Tanooki Suit returned in Mario 3D Land, but unlike its NES counterpart, did not allow Mario to take to the skies. So, as we've seen over the past few years, Mario's ability to take to the skies has been lessened and lessened. Possibly for good reason. In retrospect, some of Mario's flight mechanics seem broken by today's standards (letting players essentially skip many levels in Super Mario World). New Super Mario Bros. Wii obviously wouldn't be the same with a more robust flying mechanic, especially with its 4 player dynamic. If the Tanooki Suit performed in Super Mario 3D Land the same way it performed in Super Mario Bros. 3, much of the game would be a joke. Nintendo has definitely decided to move away from letting Mario fly around as he did in Mario 64 and Super Mario World...but could Nintendo ever bring back a more robust flying powerup to a Mario game? Without making the game seem like a broken mess? I think they can! And I think the cape is the perfect way to do it. I think it's an item that is versatile enough that Nintendo could work it into many different scenarios. How can they do this? Let's look at a couple of other recent games to see how Nintendo could turn Mario's cape into a memorable 3D Mario experience. 1.) A cape that can be used for way more than flight. Mario's cape wasn't simply fun because it allowed him to fly, but because it also let him attack enemies, hover, and affect things in the environment like stray shells and powerups. Perhaps there's even more potential for the cape beyond those mechanics? Let's look at Wind Waker to see where this could go. 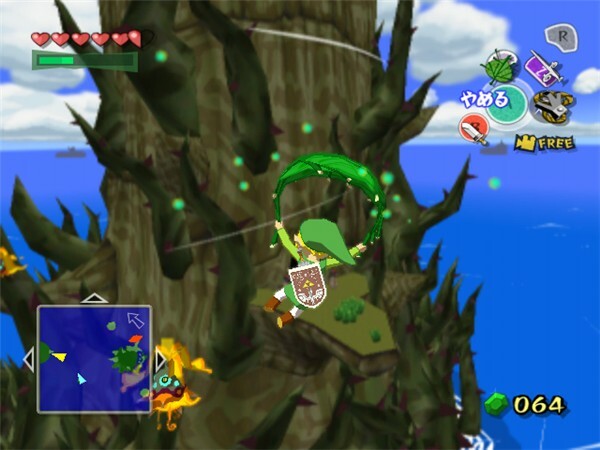 In Wind Waker, Link could use the Deku Leaf in a couple of different ways. First and foremost, he could wave it like a fan to blow gusts of wind at enemies, switches, and other objects. Second, he could use the Deku Leaf as a parachute, hovering over long distances. Perhaps there could be a way for Nintendo to incorporate some of these ideas into a Mario game? Maybe a tap of the B button could allow Mario to spin...but holding the B button charges up Mario's spin, letting loose a gust of air. There could be levels geared around this mechanic, allowing Mario to move platforms, attack enemies, and various other things. In one possible scenario, Mario jumps on top of a lily pad in a water level. He could use the cape to blow himself across a river, allowing him to access a platform that he couldn't reach simply by jumping out of the water. It wouldn't be unlike moments in Wind Waker, where Link used his Deku Leaf to move a platform across a chasm. In another possible scenario, Mario needs to land on some platforms in a lower area of a level. Falling from that height would damage him, but thankfully, he can use a nearby Cape powerup to help him on his way. Nintendo did this in Super Mario 3D Land, but they did this primarily with the propeller block. In a future game, they could do this simply with Mario's cape. With a versatile Cape powerup, Nintendo could have Mario go through a falling segment, and then seamlessly transition into a flight or platforming oriented segment. If I could name one obvious flaw with Super Mario World, it's that the cape makes the game far too easy. Like I said before, many levels can essentially be skipped with the cape, especially early levels in the game. Nintendo could combat this by designing levels specifically around the cape. In Batman: Arkham City, Batman's cape can be used to nosedive and then ascend...not unlike Mario's cape in Super Mario World. There are many challenges in Arkham City that test your ability to use Batman's cape successfully. In a future Mario game, they could have levels that are designed around this ability. Perhaps Mario's ability to nosedive can only be used when Mario is falling from a tall height. That way, the player couldn't use this ability to bypass easier levels in the game. Imagine a tall waterfall like in Noki Bay. Mario Jumps off the edge of the waterfall and transitions into a diving animation. By pulling down on the control stick, Mario would pull up like a plane, and can then glide to far away areas. Maybe some levels could allow Mario to fly indefinitely, like an on-rails flight section. 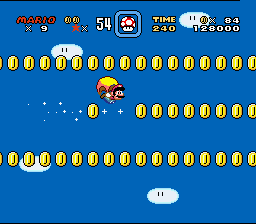 One level could feature a powerup that grants Mario the ability to stay in the air. Think Star Fox but with Mario and his cape (or possibly Mario and Yoshi with Yoshi wings!). Mario is certainly no stranger to on-rails flight. Up until now, my ideas for Mario's cape have been fairly conventional...but why not go all out with it? Maybe Mario could take the cape off and use it as a magic carpet in one level? In one level, he could roll it up to use like a baseball bat. In another, he could use it like a grappling hook to swing from pole to pole. In another level, he could wrap it around himself to roll down a hill. Maybe they could somehow take some nods from Paper Mario, and get really creative with how Mario uses his cape. After all, it's a flat piece of cloth, so they could practically do anything they want with it. In past games, we've seen that Mario's ability to fly has a way of unbalancing the game or making it too easy...but it's certainly fun to fly around levels. Perhaps late in the game, you finally earn the ability to freely fly around levels you've already been to. It could be helpful in retrieving hard to get Star Coins and other secrets. Maybe as you progress through the game, beanstalks appear at the beginning of certain levels, allowing you to start a level high in the air. You could then nosedive and soar your way to secret areas, or beat a level very quickly in a time trial. These were just some ideas that came to mind, but I'm sure there's a lot that can be done with Mario's cape in a 3D game. Maybe some of the ideas I thought of sound broken or not fun (we wouldn't want to see the return of the "blow" mechanic from DKCR, for instance), but I think it would be really cool if Nintendo could finally nail flight in a 3D Mario game. The way they've done flight in Mario 64 and Galaxy feels a little too isolated from other parts of the game. I think that if the cape was used for a lot of different things, then flight mechanics may not seem so out of left field. Flying would simply be one of many things that the cape could do in the game. What are your thoughts? Can Nintendo let Mario fly again without making the game too easy or broken? Is the idea too ambitious for a 3D Mario game? Do four major gaming platforms in the marketplace help or hurt the industry? Heh, I made a post about this a WHILE ago, lamenting the idea that Mario may never fly again. A lot of your post echoes my thoughts. I always liked the aesthetic of the cape over the racoon tail. Love to see a return of it someway and the ideas you have are pretty good. Great editorial and I agree, especially concerning making areas designed for flight. I hope they go this route in the next game. Also, I never quite understood that picture of Mario holding his cape like that. What exactly is going on? I mean, I know what he's doing, as I have done it in-game countless times... But what the heck is going on? Magic boot tape? It is a magic cape. Duh. Mario 64 and Galaxy only had flight in sandbox areas. If another sandbox Mario game comes out (and one should! ), hopefully they'll include flight. Nice, I like your #3. It's pretty cool to think of how much stuff they could do with something as simple as a magic cape. I'll never forget using the wing cap in SM64 for the first time. I felt so free, soaring through the sky in a 3D world. Granted, it was more of a glorified hang glider. I definitely want to see the return of full flight in a 3D Mario game, and the cape sounds like a great method of doing so. Excellent ideas Mr. Pogue, I don't really have much to add! I mean, really, most of Mario's flying abilities HAVE been glorified gliders. The only time you really get to "fly" in Mario 3 is with the P-Wing. It's almost like the game's Super Guide in a way, haha (but was handy to reach secret areas sometimes). In Mario World, you don't really fly, but you just move in a horizontal sine wave across the sky. In Mario 64, you don't really gain altitude at all. What each of these games does though, is that they create the illusion of flight. Of freedom. I don't know if Nintendo would even need to let Mario "fly" in the most literal sense of the word. Perhaps in some levels, they could let him "fly" but for the most part, I'd be happy just gliding around like Batman does. They could keep supplying you with something to let you gain altitude like an air jet that rises out of the ground or something like that. Maybe they could do something similar to how Yoshi's Island handles Yoshi's transformations. There will be a point where you hit a block that turns you into a helicopter or a sub or a train, and then the gameplay changes for that level. Maybe in a future Mario game, there would be moments where you get certain powerups that transform your cape into something else...a magic carpet, a grappling hook, etc. Maybe Mario would use his cape as a scarf in a winter level, and as a beach towel in a beach level. He could drench the cape with water and then ring it out over a beanstalk to make it grow so he can reach a new area. AND THEN AT THE END OF THE GAME HE'D FIND A FLAGPOLE AT BOWSER'S CASTLE, TAKE THE FLAG DOWN, AND PUT THE CAPE AS THE NEW FLAG, MARKING HIS TERRITORY AS SUPREME BADASS OF THE UNIVERSE. Then maybe he'd walk away with a big explosion behind him like Hugh Jackman. Super Mario World was my first Mario, so I'd love to see it in a 3D game. Galaxy 3/Universe please, Nintendo? I've heard Nintendo say that it was too sophisticated for Mario to fly on a handheld. Super Mario 64 DS, anyone? Flying is a pretty messy ability to have in a platformer. Unless it's Nights, or something. It IS a cool reward, though. I mean, why NOT let you fly around the Galaxy levels if you 100% the game? If you enjoyed the Cape, specifically, I would recommend trying out Prototype, which, believe it or not, has an air-leaping mechanic that is very similar. And very fun. I absolutely loved the cape. I used to go back to that level in the first pic just to fly around and collect coins, haha. "Perhaps late in the game, you finally earn the ability to freely fly around levels you've already been to." This is an awesome read man. I definitely agree that too much flight early on could unbalance things. In fact, it's interesting that you brought up Batman because one of my complaints about Arkham City is that it kind of gives you too many ways to easily get about the city too soon, such that you can just grapple from building to building no problem and glide around easily and it is never a challenge to get around the city. Sure you can't fly, but still, it feels like Batman is a bit overpowered there as well. It almost reminds me of the Powerwings, albeit the city is more a hub for the rest of the game in Batman, but still, it's a big part of the game and it doesn't offer much challenge of movement the way it is set up, you can just breeze past all of the enemies and such. It's still awesome because it's completely optional. People ruining their experiences by being suped up all the time and this not finding enough challenge is definitely not Nintendo's fault. You could just replay the first level and grab two Tanooki suits. But I see where you're coming from. Flight would be cool, but what I'd really like to see is a Pegasus/Speed boots equivalent. A Cheetah Suit? Chili Pepper Yoshi had the right idea in SMG2 but they should really go crazy with it, and design levels around it. At the very least we should get flight back for the 2D games. SMW was the last one to have it right? Not sure if we will ever see the cape again but the idea of Mario's power-ups having multiple functions/uses intrigues me. But does that add too much complication to a game that should be about platforming first and foremost? Mario games are all about balancing all these crazy things while still remaining true, I'm excited to see what they come up with next. @Marsh I've thought about that too actually. Perhaps many uses of the cape would have to be largely superficial. Maybe Mario uses it as a scarf when he's standing still in an ice level or something like that. Either that, or the structure of this Mario game would have to be different. Or, maybe some of these uses would only lead to secret areas. Maybe there's some shallow water in one area of a level, and you find a little plant nearby that you could ring Mario's cape over to water the plant. The plant turns into a beanstalk and leads to a secret area. Perhaps these little puzzles could be in every level, and it would be a little game in itself - navigate Mario through a perlious part of a level to get water to a plant. You wouldn't be able to float because your cape would be soaking wet. If you spin, then you can't do it, because that would dry Mario's cape off! What's interesting is that this cape would really only be a part of what I would deem my "dream Mario game." I think I've mentioned this before but it was a while ago. Other factors would include the game being linear 3D for the most part like Mario 3D Land, with a bigger scope, and with no loading like Limbo. One seamless platforming adventure. Reach a checkpoint and zoom out the map Google Earth style where you can see where you've been and where you're going (in a Super Mario World esque overworld map). Go back to old levels you've beaten and quickly hop back to the newest level. On a mountain level? Look out in the distance and you can see places you've already been to, or places you have yet to go to. See a cave in the distance that you can't get to? At some point you'll find a secret that lets you go there. Later in the game, get a flying powerup that lets you soar over levels you've already completed and access new secret areas. I LOVE Super Mario 3D Land but if there's one area I want to see Mario games go back to, it's the idea of a more cohesive world. I always thought it was very satisfying in Super Mario World to explore that world map. It didn't really feel like levels were simply on a grid. You had no idea where the next level would be at times, especially if you found a secret. If a spot on the map is in water, then it's a water level. If it's in a cave, then the level's in a cave. SMB3 did this, but I just thought it felt more satisyfing on a map that wasn't grid based. Now what if they had that map from Super Mario World...but you could basically gradually zoom in on the map until you get to Mario? Let's just blend the map and gameplay sections together so it feels like you're making your way through one huge world...but without sacrificing the platforming goodness that we all love about Mario. Perhaps something like that isn't really possible with today's technology, at least with ambitious Mario levels...but one can dream.